Tandem Trike - Welcome to Brain Care Law! 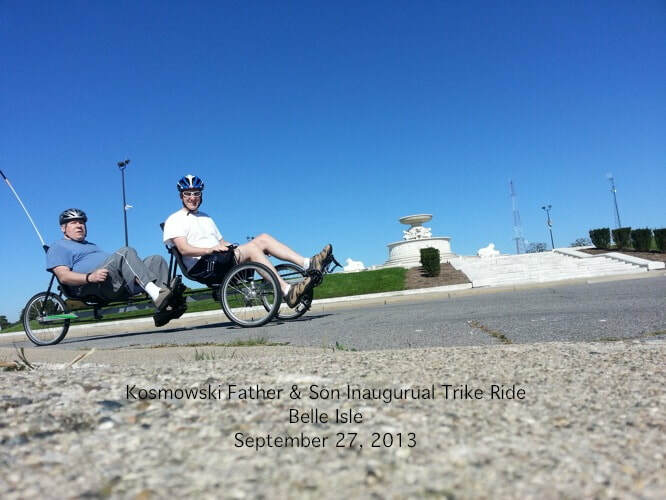 In 2013, I was searching for a way to keep Dad physically active. He always loved motorcycles. Anything with two wheels would test his ability to balance. I searched for tricycles, and found a Grand Rapids company, Terra Trike. The company offers a two seat tricycle, known as a tandem trike. I called around to several Southeastern Michigan trike shops, but they did not stock the tandem tricycle. I called around to Ohio shops, and found a tandem tricycle in stock at Fairfield Cyclery. ​The Terra Trike Rover Tandem fits in the back of a Chrysler Pacifica minivan once the seats are folded down. Dad enjoys the tandem tricycle because he can pedal independently. He enjoys the fresh air and freedom of being outside.